Organising music files consistently is a smart thing to do. It means music is easier to find for synchronising your home collection with your smartphone and legacy music players that don't support tagging can still display basic information about your music. Multi-disc albums present a problem though. Default organisational schemes such as a simple artist/album layout don't cut it - the disc number is not preserved. This means, when you're playing an album such as All Things Must Pass or Speakerboxxx/The Love Below, the tracks may play back in the wrong order. So, multi disc numbering should be reflected in your music file structure. But how? Here are a couple of ways. 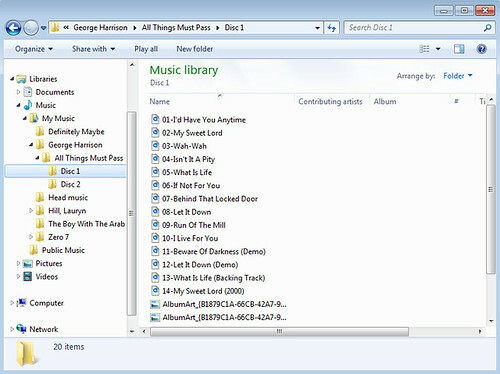 The advantages of this approach are that all files are in one folder, which may make it easier to play the album on certain devices. The disadvantage is that the album is a little more difficult to separate if desired. This tends to be my own preference but it's a fairly cosmetic consideration. All this theory is great, but how do you put it into practice? 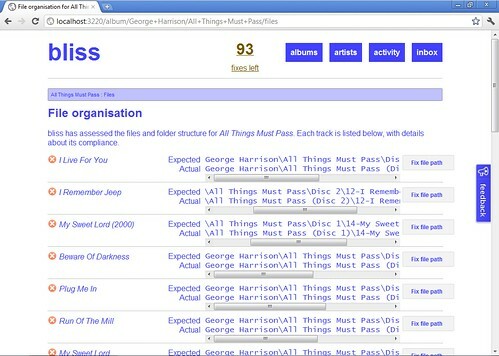 bliss added the ability to use disc numbers in file organisation patterns a month or so ago. In the same release it also added a powerful new feature that can be used elsewhere in file organisation patterns: conditionals. Conditionals provide a way of adding a piece of file organisation structure, but only if a given tag exists. Conditionals are important for tags which might not exist in your music. If you were to use the <discnumber> tag without a conditional you would likely find a lot of your music cannot be assessed for file organisation compliance because most non-multi disc albums do not have a DISCNUMBER tag. The interesting <discnumber> bit basically means: if the album has a <discnumber>, include "<discnumber>-" in the target file name. Notice how a literal "Disc " is added to the folder name. This makes it easier to understand what the folder represents. You could do this in the first approach too. In addition, note how an extra folder is also added when a <discnumber> is present, by means of the trailing "/". Remember, when a <discnumber> is not present, the pattern in between the "|" characters is ignored, so the trailing "/" is not evaluated and there are no extra folders created. A quick caveat: use of <discnumber> (currently) only applies to where the DISCNUMBER tag is actually used and present in your music files. 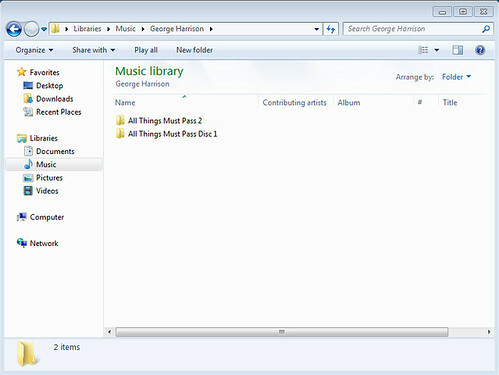 It does not interpret 'disc number artifacts' in album names, for instance "All Things Must Pass (Disk 1)". Such albums will not be interpreted by the <discnumber> token and will be treated as 'normal' albums if the DISCNUMBER tag is not present. Let's walk through how bliss can organise multi disc albums. We'll start with the album we've discussed in this blog post, All Things Must Pass. It's the two CD, early 2000s re-issue, but the same can be applied to the original three record version. We'll aim to split the album folder into two folders, one for each disc. Below this, we'll keep the rule on 'manual' operation while we check where bliss wants to move files to. With our pattern set we can then click 'Apply'. Once the rule is applied, bliss assesses all my albums for adherence to the pattern. The files that make up All Things Must Pass don't adhere so it's marked 'Uncompliant'. You can just about see the target file locations bliss wants to move files to. Notice these locations have the "Disc n" folder as part of their structure, inside the parent album folder. Clicking Fix all file paths moves all the files. We can then do the same for the second album in the overview screen. The albums now show up as compliant. Perfect! Of course, if I put the other, single folder pattern in as my file organisation pattern, I would have a different structure. Good luck in your organising you multi-disc album files! Thanks to john_a_ward for the image above.